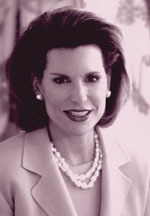 BOCA RATON — Champions for the Cure has announced that Ambassador Nancy G. Brinker, founding chair of Susan G. Komen for the Cure, will be the keynote speaker at the fourth annual Pink Ribbon luncheon. This breast cancer educational seminar will be held at Woodfield Country Club in Boca Raton on October 3 at 10 a.m. Ambassador Brinker promised her dying sister, Susan G. Komen, she would do everything in her power to end breast cancer forever. In 1982 that promise became Susan G. Komen for the Cure and launched the global breast cancer movement. Komen for the Cure is now the world’s largest grassroots network of breast cancer survivors and activists fighting to save lives, empower people, ensure quality care of all and energize science to find cures. Time magazine included Brinker on its Most Influential People in 2008" and Brinker was recently appointed as The World health Organization's goodwill ambassador for cancer control. This year’s honorary chairs are Ambassador Ned L. Siegel and Stephanie Siegel. Stephanie is on the board of the Komen Advocacy Alliance,vocacy Alliance is the nonpartisan voice for over 2.5 million breast cancer survivors and the people who love them. Members of this 501c4 organization translate the Komen promise to end breast cancer forever into action at all levels of government to discover and deliver the cures. Since its inception, the Pink Ribbon luncheon has grown into a sold-out audience of 400 women and men, The 2008 event raised $40,000. Proceeds from this event will benefit the South Florida affiliate of the Susan G. Komen for the Cure to benefit breast cancer research and causes. Up to 75 percent of the funds stay in Palm Beach, Martin, and St. Lucie counties. The money raised is used for community outreach and education, to fund mammograms, diagnostic tests, and treatment for the medical underserved. The Champions for the Cure executive luncheon committee includes Fern Duberman, Lynn Baltimore, Kathleen Bocek, Denise Brooke, Annie Morris, Karen O’Byrne, David Ouimette, and Darlene Wolff. This will be a sold-out event. We invite you to register now online by visiting the Komen South Florida website and clicking on “Pink Ribbon Luncheon.” Individual tickets are $75. Beautiful prizes will be offered in a Chance Drawing during the lunch. Chance Drawing tickets are $25 for four; $40 for eight, and $50 for 12. Checks can be made out to Susan G. Komen for the Cure and mailed to Debbie Wemyss, Development Director for the Susan G. Komen for the Cure South Florida Affiliate, at 1309 N. Flagler Drive, 5th Floor, West Palm Beach, FL, 33401.